Jordan Peele's Us and Captain Marvel share an Easter Egg that has helped bring a classic movie back into the spotlight. 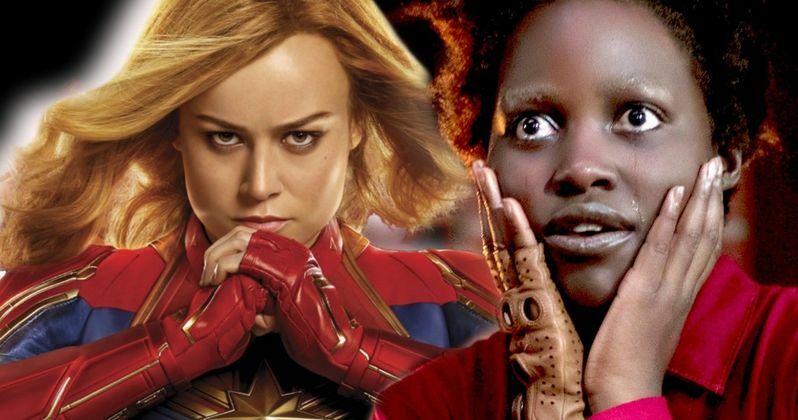 The Carol Danvers standalone story is getting ready to pass the $1 billion-mark at the box office and was knocked from its number one spot over the weekend by Peele's latest horror movie, which has already broken records. Us holds the third highest grossing horror movie debut of all time, thanks to its epic box office weekend. There are some slight SPOILERS for both movies below, so read ahead with caution. When Captain Marvel first lands on Earth, she crashes into a Blockbuster video in the year 1995 where she blows away a cardboard cutout of Arnold Schwarzenegger. As Carol Danvers observes her new location, she picks up a VHS copy of classic 1980s movie The Right Stuff. This movie is also shown in Jordan Peele's Us, but for a much different reason. Philip Kaufman's 1983 epic historical drama is based on Tom Wolfe's best-selling 1979 book of the same name. It tells the story of the seven military pilots who were selected to be the astronauts for Project Mercury, which was the first manned spaceflight by the United States. The Right Stuff was an influence on Captain Marvel and little hints to the movie can be found throughout. Carol Danvers is also a military test pilot who ends up making some history of her own. The Marvel Cinematic Universe movie also shares a theme of working together as a team to solve a common problem, even with some allies one would not expect. However, Us takes the Easter Egg and turns it into a different meaning for its theme. The Right Stuff isn't as noticeable in Jordan Peele's Us as it is in Captain Marvel, but it's there. The VHS is featured in the opening scene when the TV is displaying the Hands Across America commercial. Where Philip Kaufman's movie brings the very different pilots together to unify, Peele decides to go in the opposite direction and state that maybe human beings and those differences often drive a bigger wedge and takeover instead of working together for the common good. Sometimes the darker impulses take over the lighter. With both Us and Captain Marvel mentioning The Right Stuff, it has put a new look on the classic movie. It was not a box office sensation and its 192-minute runtime may have had something do with that aspect. However, it was a critical sensation and it ended up earning 8 Academy Award nominations and won 4 of them, including Best Editing, Best Score, Best Sound, and Best Sound Effects Editing. It's pretty cool that two completely different movies decided to tuck a little tribute to The Right Stuff without knowing about each other. You can head over to Universal Pictures to get information on Us theaters and showings.